In my house growing up, I could always tell it was “takeout night” when I saw the yellow phone book and a pile of paper menus sprawled out on the kitchen counter. That phone book and its accompanying menus lived in a drawer next to the refrigerator. And for the better part of my life, that drawer was the place we went to when we wanted to try a new restaurant or to look at the menu from a restaurant we already knew and loved. Fast forward to today, and it’s clear that things have changed quite a bit. The phone book and paper menus that were so important before seem out of place in today’s increasingly mobile world. Even my parents — and they’re not the most tech-savvy people — can pull out their smartphones, do a quick search, and access all the information they would ever need in a matter of minutes. This is great news for consumers and is even better news for businesses that are hoping to reach their next great customer. One recent study found that 75 percent of consumers used a mobile device to get real-time location-based information (Pew Internet). 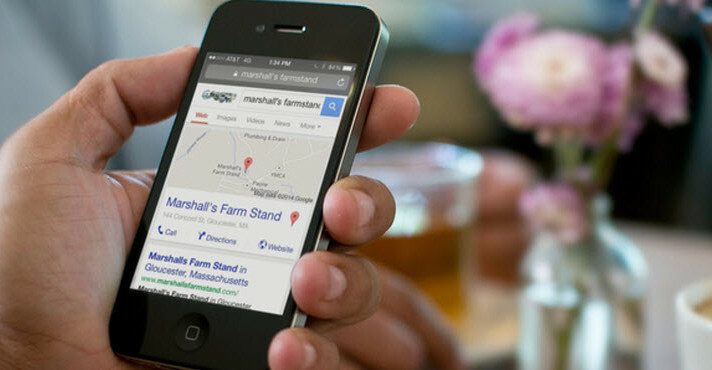 90 percent of mobile searches lead to an additional action (Search Engine Land). Taking advantage of this important new trend is a lot easier than you might think. It starts with identifying the ways people are finding your business online. Perform a search for your business with a search engine like Google, and jot down all the results that appear on the first page of your results. 1. Pages that you’ve created. 2. Pages that were created by someone else. Your next step is making sure that the information on these sites is accurate, and that your most important business details are easily accessible. For the pages that you’ve put out there, completing this step should be pretty simple. Make sure your website is easy to navigate and that the information people find on your page is current. Review your social media pages, and make sure that you’re taking advantage of all the features these sites offer to help your business get discovered online. If you have a blog, check that it provides a link back to your site as well. For the other pages, taking control of the information that’s out there is going to take some time. These sites pull information in from a number of sources. As a result, you’re likely to run into some inconsistencies from page to page. Think about the information you want out there. Remember that people who are searching for your business are most likely doing so with intent to take action. Provide all of the information they’ll need to take the next step toward becoming a customer. Photos of your storefront, interior shots, staff, products, food, etc. As you start to comb through the information that’s out there, it won’t be long before you run into a roadblock when trying to fix it. You may even find yourself wishing for the days when your only concern was keeping your business in the phone book and your menus in the homes of local consumers. Don’t let these roadblocks stop you. All of the top listing and review sites should provide instructions that you can follow to optimize your listings. On a site like Yelp or Foursquare, you can even claim your location and share updates with local consumers. Once you’ve gone through all the places where information about your business is available today, the next step will be to indentify new places to have your business listed. Look to find listing sites that are specific to your industry. You can do this by searching for other local businesses, or reach out to business owners and find out what they’re doing to get discovered online. Before long, you’ll be in control of your online listings and will have more opportunities to find your next great customer. Want to learn more about how consumers are finding new businesses? Download a free copy of our latest guide: How Mobile Search Can Help You Find Your Next Great Customer.